This research was funded by the National Institute for Transportation and Communities, or NITC, a program of TREC at Portland State University. Funding was also provided by PSU School of Urban Studies & Planning, Center for Urban Studies. 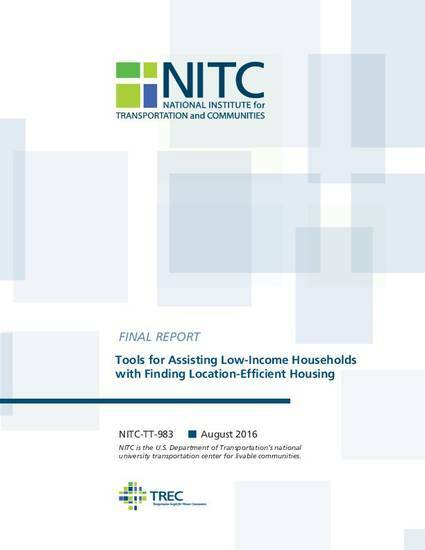 Through a previously funded research project, Encouraging Low-Income Households to Make Location-Efficient Housing Choices, our team developed a toolkit to assist households utilizing Section 8 Housing Choice Vouchers with finding location-efficient/affordable housing. These tools are currently in use by the region’s four public housing authorities (PHAs). This technology transfer project provided the tools to social service providers who work with voucher recipients in the Portland region and provided a presentation on research findings and policy implications to transportation researchers, professionals and students. Specific activities included: • In-person presentations to groups of social service providers in three counties (four presentations total) who provide case management and other intensive social services for households with low incomes. • A TREC-sponsored presentation/webinar as part of the TREC Friday Transportation Seminar series In addition, final edits were completed on a manuscript included in Housing Policy Debate’s special issue on location-affordable housing. Additional research was begun on a manuscript for submission to the Transportation Research Board.